Imagine your dream garden. A beautiful space for relaxation and pleasure. We can create your garden dream for you. You can be assured of an easy process from our first meeting right through to the final construction. What's more, we have a unique and personal service after your job is completed, so that you can be assured any questions you might have will be taken care of in our friendly and personal way. Design in Green specialises in quality, beautifully designed residential landscape and garden construction. We have been servicing the Northern Beaches and North Shore for over 20 years. We have the experience and expertise to provide you with the very best in all aspects of landscaping. Our design flair and attention to detail is the thing that sets us apart. 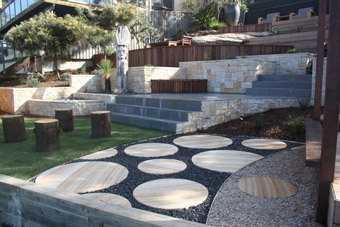 We can create a beautiful, contemporary garden especially for you. We will ensure that your experience with us is a rewarding one. Want to start the process? Click here and introduce yourself. We can't wait to meet you! For all our latest and updates.